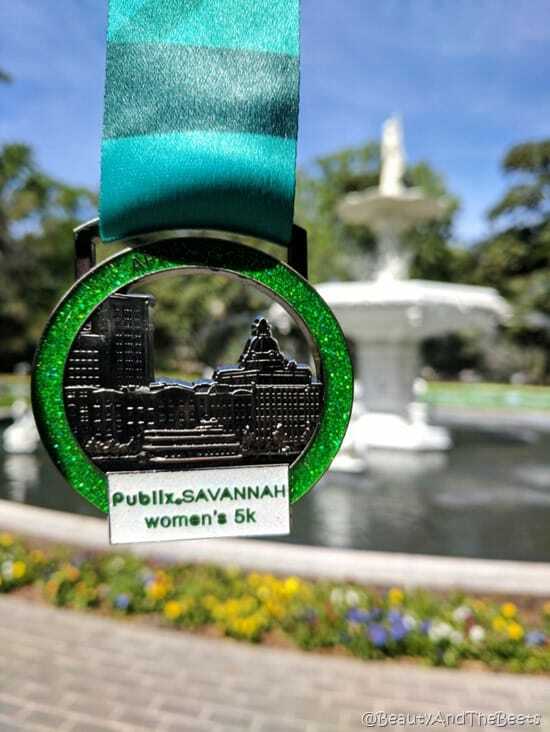 For the second year in a row, I was honored to be selected as an Ambassador for the Publix Savannah Women’s Half Marathon and 5K. Only this year became a bit of a challenge for me. I have been battling a painful pinched nerve in my neck/shoulder and there was a moment in time when I was going to cave into my doctor’s suggestion and not run at all. I was pretty devastated. Nobody likes to be sidelined with pain, and I hated to be missing out on a race in Savannah, my favorite running city. One of my favorite elements of the race is the unique gift participants receive. 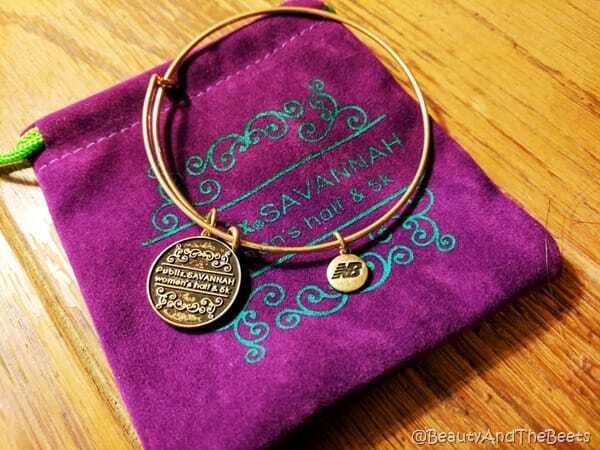 Instead of a race shirt, of which most of us have an over abundance of, the officials of the Publix Savannah Women’s race gave each runner a New Balance charm bracelet this year. So, I decided to take it easy and sign up for the 5K instead of the half marathon. I fully intended on walking at a fairly slow pace, but once I got to the start line on race morning, I was feeling decent and just decided to push myself harder. The weather was perfect for running – in the low 40’s with plenty of sunshine. I first met with a few of my fellow ambassadors for a photo op before the run, then lined up toward the back of the pack in case I needed to walk. 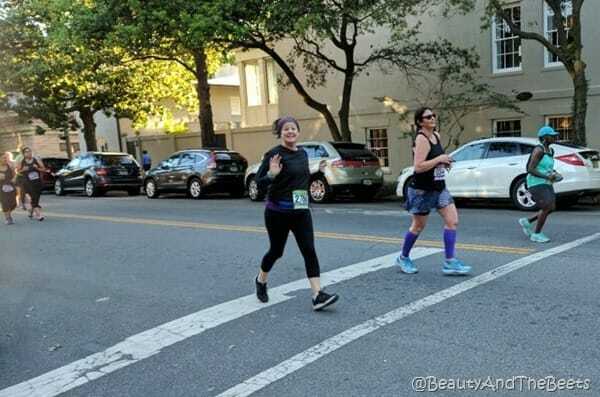 I was reminded how much I love this race as so many amazing women gather to participate- from serious runners to friends walking together on a beautiful Saturday morning. I am very proud of my race as I finished much faster than I had anticipated, only missing my personal best by a few seconds. 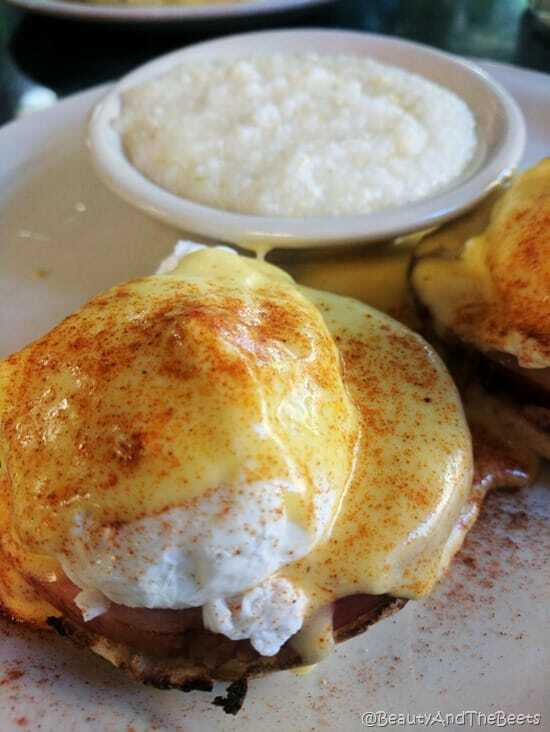 I also earned my breakfast of eggs benedict and grits from Clary’s Cafe. The restaurant is along the half marathon route so we enjoyed breakfast while we watched the runners race by. Joy Miller, the race’s winner the previous two years, was way ahead of anyone else, and eventually ran to her third consecutive victory. Next year, as I improve my running, I am setting my sights on beating her. I can do it, right? I made it back to the race in time to see a few of my fellow ambassadors make it to the finish line. 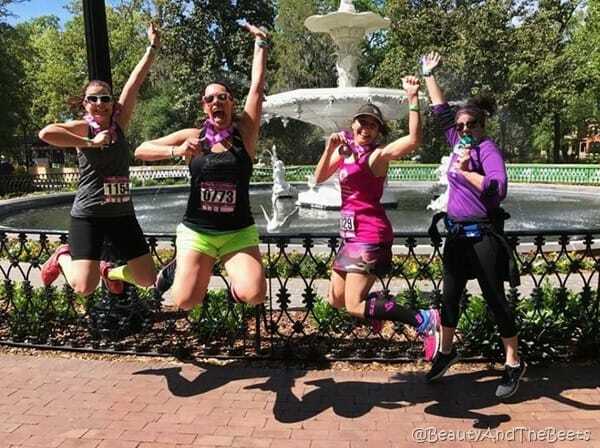 We took a few post race pictures in front of the Forsyth Park Fountain. Meghan from Meghan on the Move, Jenn from Runs with Pugs, and Amy from Mom’s Magical Miles all ran the half. 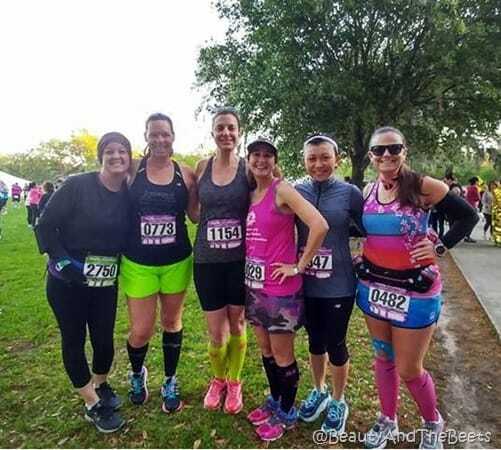 You may recognize these ladies as these were the ladies I ran the Rock’n’Roll Savannah Half Marathon last year. We dubbed that run the “Savannah Stroll.” I imagine we will repeat our stroll again later this year in November for the Rock’n’Roll race. 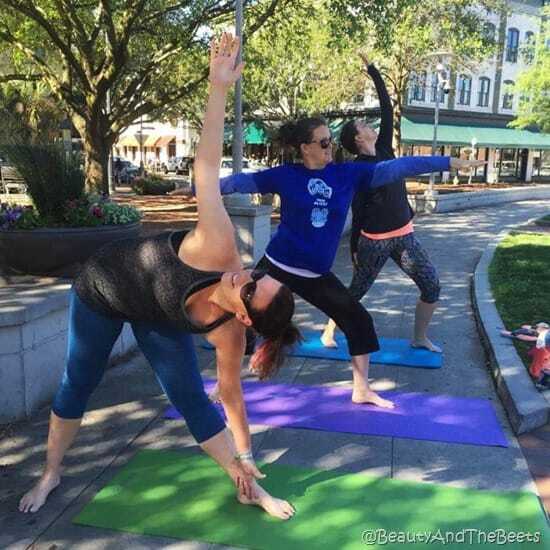 Also included during race weekend is Sunday’s annual Yoga on the Square, this year sponsored by Dancing Dogs Yoga in Savannah. Unfortunately, with my neck and shoulder issues I opted to not participate this year. I did do the yoga last year and loved it. I am already looking forward to next year. I will be starting physical therapy next week in hopes that I will be able to avoid surgery for my pinched nerve and I plan to return next year pain free. Stay tuned to Beauty and the Beets for information on next year’s race- see you in 2018! Congratulations on your 5K! I also did the 5K because of being out of running with tendonitis for 6 weeks. It sounds like you had a good time and I’m glad you felt better once you got out there and came close to PRing. It was a very beautiful day and the whole weekend was amazing. Like you, I hope to return next year and run the half marathon course. The energy was so great and you can’t beat so many women being positive and encouraging to one another. I hate that I missed the picture! I tried to find the tent but there were a few tents out there, and I had to get in the porta potty line before it was too late (I still had to leave the line to go to the start, though). Your breakfast looks so good too, and I hope you’ve had a good recovery over the last few days.